The Oxford dictionary defines volatility as the liability to change rapidly and unpredictably, especially for the worse. When we are saving for retirement or relying on our retirement earnings after many years of hard work, this word sounds terrifying. What a terrible idea. Who wants their investment return to change rapidly, unpredictably for the worse? No one. So why do millions of investors tolerate the volatility of the returns in the stock market? The answer lies in the risk return trade off. 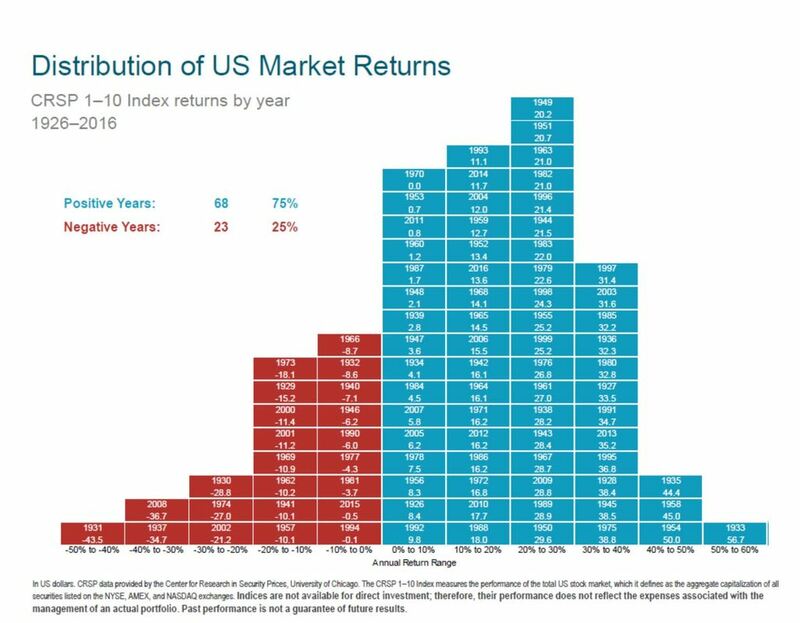 The more variable an asset’s return, the riskier the asset, the greater the return investors demand from that asset. Whereas investments with no risk offer a small return. The average annual return on the One-Month Treasury Bill - typically considered a risk-free investment, from 1997 – 2016 was 2.1%. During that 20-year period, investors in T-bills never had a loss, although there were periods after the great recession when returns were zero. Inflation over the same period was 2.1%, leaving investors in One-Month US Treasury Bills with a return after inflation, or real return, of 0% annually over the 20-year period. Compare that to the popular, but volatile, S&P 500 Index over the same 20-year period. By contrast, the S&P 500 produced annual losses in four out of those twenty years - the greatest being a whopping loss of 37% in 2008. So why would an investor take such risks? 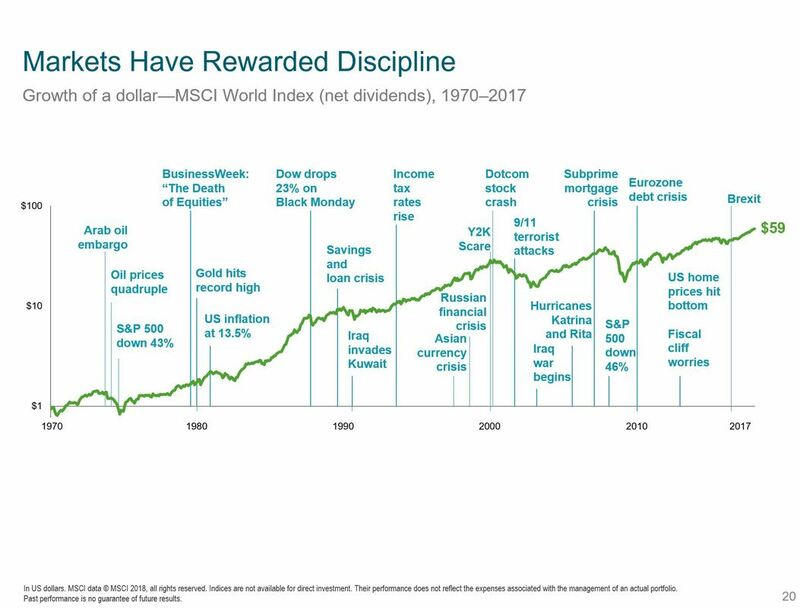 Because over the same period the average annual return on the S&P 500 was 7.7% or 5.6% after inflation, providing investors with meaningful real return. Most investors are only concerned with downside risk, or the prospect of a loss. (I’ve never heard of someone complaining that their upside return was too great.) In fact, historical data tells us that the US market has been negative approximately 25% of the time, or 23 of the last 91 years, from 1926 to 2016 (see chart below). Still, during this longer period, investors were provided with meaningful real return for the risk taken. Per the Center for Research in Security Prices at the University of Chicago, the US Market provided an average annual return of 9.8% from 1926 to 2016, or 6.9% after inflation (2.9% inflation data provided by Morningstar). When money is invested for the long term, and the investor doesn’t overreact to negative years, the returns are substantially greater. Investing in the equity market will be volatile. No one can accurately predict if a year will be positive or negative, but over history, that volatility has been rewarded by greater return.